Anna Schultz of Grand Rapids, Michigan, remembers getting in her car after attending church on Sunday, September 30 and then her memory goes blank. What happened next, she’s had to piece together from witnesses. Anna suffered a cardiac arrest while driving and cruised through the intersection of 28thSt. and Eastern Ave., where her car collided with a bus stop sign. At the scene, a passerby pulled her out of the wreckage and began CPR chest compressions. Anna remained unresponsive until another good Samaritan arrived at the scene and began mouth-to-mouth resuscitation. At that point, Anna gasped for air and then the paramedics arrived to take over. Anna has reimagined that first breath countless times since the fateful day. A deeply religious woman, Anna calls it the “breath of life.” She now considers the former stranger who performed mouth-to-mouth resuscitation, Sharon Bruce-Carey, among her dearest friends. SKLD patient Anna Schultz, left, is picture with Sharon Bruce-Carey, who saved her life after a car accident in Grand Rapids. 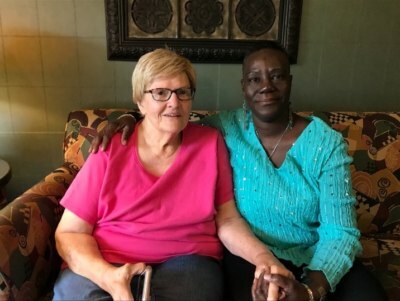 Since the accident, Anna and Sharon have visited together numerous times, both at the hospital and at the SKLD Medical Residence East Beltline where Anna recuperated for three weeks. During her final week at the facility, SKLD staff organized a special Olive Garden dinner for Anna and Sharon, together with their husbands, Mike Schultz and Christopher Carey. Deb McCollum, administrator of SKLD East Beltline, says she was so moved by the incident that her team presented plaques to both women. “I’ve been an administrator for 15 years, and I’ve never heard a story like this one,” says Deb, who admits to sobbing when Anna shared the story of her rescue. Anna still doesn’t know the identity of the first responder at the scene of the accident, who pulled her out of the car and performed chest compressions. She spoke to the police and still hopes to find the woman so that she could thank her. As for Sharon, Anna says she feels like she has known her forever. Now that Anna is at home recuperating, both women have no doubt they’ll stay connected. “I believe that God saved my life through this woman who performed the breath CPR,” says Anna.